Renzntzman: "I'm Comin' To Join Ya..."
I talked to my parents this morning. They joined a new church yesterday and the pastor is coming over to their house today for a visit. The pastor's name? 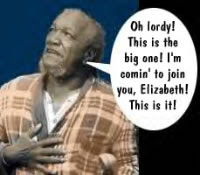 Fred Sanford. I wonder if he fakes heart attacks to get people saved.